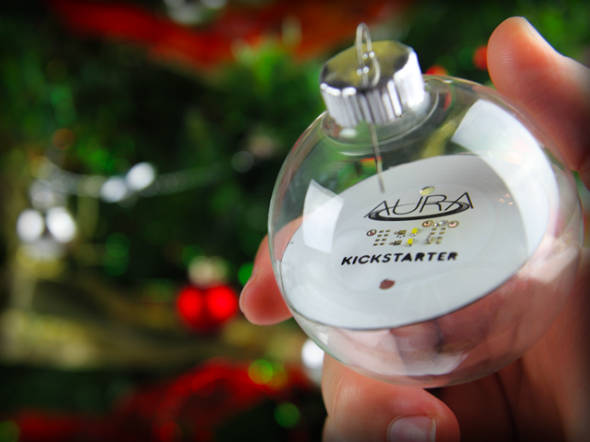 Aura's wirelessly powered Christmas lights will keep your tree safer from your cat. My cat will chew anything he can get his teeth around. Plastic bags. My glasses. The corners of Amazon boxes. Six ruined MacBook power cords and counting. How he has not yet been fatally electrocuted, I do not know (although this Reddit thread propounds some theories). That may not be strictly accurate. Nineteenth-century Christmas trees were lit with candles, a practice that sometimes resulted in the entire house becoming suddenly and unfortunately illuminated. But Aura founders Chris Higgins and Hardeep Johar have alighted on what they believe is a safer solution: a charging ring that transmits power wirelessly to receivers embedded in LED bulbs that you hang from the tree’s branches like ornaments. Snap the charging ring around the base of a small tree or around the middle of a large one, plug it into the wall, and it will keep the lights on until you flick them off with the tap of a free smartphone app. No batteries are required, and there are no strings to untangle. Yes, there’s still one power cord, but that’s what cord protectors are for. Higgins and Johar don’t explicitly tout the lights’ cat-thwarting qualities on their Kickstarter page, and Higgins says he didn’t have any feline friends in mind when they conceived the project. (“I’m not a huge animal person, because I’m allergic to everything.”) Instead, he was thinking of his mother, who “just wraps the hell out of the tree” with so many wires that they burden its branches. Wireless lights means no wrapping, no tangling, and less of a fire hazard. Plus, Higgins and Johar say the LEDs should last for up to 20 years at full brightness. “Since the LEDs never need to be changed, we are able to permanently seal the ornament so that they can’t be damaged, creating a more reliable Christmas light, and saving you from buying new lights every year,” they write on the Kickstarter page. The original seal was glass, but they added a plastic option after hearing from parents concerned that their children would smash the glass balls somehow. Unfortunately, the lights won’t be ready in time to put on this year’s trees. The estimated delivery date is October 2015. But you can pre-order a box of 12 for a donation of $65 or more on Aura’s Kickstarter page. Assuming the lights function as advertised, Pinot is going to be one very disappointed kitty next Christmas. But at least he won’t be fried.